These appropriations fund revenue sharing programs. The state of Michigan collects more than $1.5 billion that is then turned over to local governments. Of this amount, a little more than $679 million is constitutionally mandated, while the remainder is distributed by legislative direction. Some of these funds are distributed through the Revenue Sharing Act of 1971, while others are distributed through individual tax statutes. Author’s Note: The FY 2005 revenue sharing proposal may change this line item substantially. Governor Granholm has proposed effectively suspending the statutory county revenue sharing payments of $183 million. This and other cuts to the statutory portion of state would reduce the total amount of statutory state general revenue sharing grants line item to only $443,500,000. As this document went to print Granholm’s proposal was still an undecided issue in the legislature. If the legislature refuses to adopt the program change state statutory revenue sharing will stand at $627,100,000. Based on this figure, the Mackinac Center for Public Policy makes its recommendation of a 50 percent cut in state revenue sharing. The state should reduce its revenue sharing by 50 percent of what is not mandated by the Michigan Constitution. This would reduce the injustice of taking from some Michigan citizens to give to others, and would improve the efficiency of local governments. A 50 percent reduction in statutory revenue sharing would yield savings exceeding $313 million. This money should be redirected to the General Fund. Savings: $313,550,000. 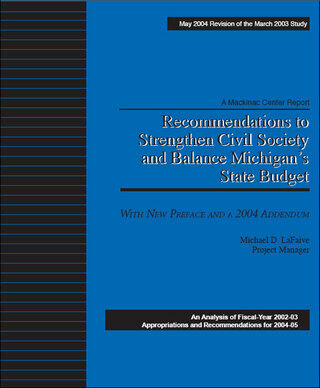 Governor Granholm’s 2005 proposal decreases the gross appropriation to $1,135,400,000.